Students in most high school woodworking programs don’t accumulate enough class room hours for them to graduate with a Green Credential, which requires a minimum of 800 hours at school or work. However, we want students in this type of program to have a way of participating in the WCA as well as providing a path to an eventual credential. to a certificate recognizing their achievement. If, in the future, a student who has earned a Sawblade Certificate moves on to work for a WCA member company or attends a member post-secondary school, they can build on what they’ve already donate earn a full Green level credential. To participate, the student’s school must become an EDUcation™ member and have at least one instructor trained as an Accredited Skill Evaluator (ASE). Purchase a Passport to become a member of the WCA. Includes 10 free assessment credits. Pass the Skill Standards BASIC Measuring and Layout evaluations. Score 80% or better on WCA Sawblade written/online test. Evaluator records successful Tool Point Evaluations in the WCA Registry. Email a list of the student names to info@woodworkcareer.org, asking for Certificates to WCA officials. Certificates made and sent to the Teacher for Award Ceremony. 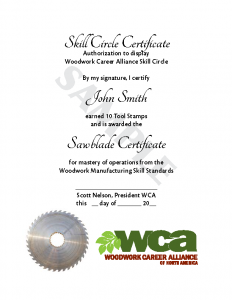 Student receives Sawblade Certificate, signed by WCA Officer.